Revealing another 400,000 classified US military documents, whistle-blower WikiLeaks has indicated "compelling evidence of war crimes" and a "systematic sectarian cleansing" that led to the mass killing of civilians in Iraq. The Pentagon has denied the charges but the secret files related to America's war in Iraq leaked on Friday provide a new picture of how many Iraqi civilians have been killed, a new window on the role that Iran has played in supporting Iraqi militants and many accounts of abuse by Iraqi's army and police, according to The New York Times which got early access to the papers. WikiLeaks founder Julian Assange leaves a news conference on the Internet release of secret documents about the Iraq War, in London on Saturday. Rescuers were today frantically searching for two dozen people missing in Taiwan after Megi lashed the island killing at least 12, as the deadly typhoon made landfall in China. Megi, the strongest storm to hit the northwest Pacific in two decades, killed 36 people after it battered the Philippines earlier in the week, barrelling via Taiwan as it menacingly moved towards China’s southern coast. Three suicide bombers wearing police uniforms and burqas today attacked the United Nations office in the western Afghan city of Herat, senior police and UN officials said. There were no casualties among UN workers, Delawar Shah Delawar, deputy police chief of Herat province, told AFP after the raid, which was claimed by the Taliban. Revealing another 400,000 classified US military documents, whistle-blower WikiLeaks has indicated "compelling evidence of war crimes" and a "systematic sectarian cleansing" that led to the mass killing of civilians in Iraq. The Pentagon has denied the charges but the secret files related to America's war in Iraq leaked on Friday provide a new picture of how many Iraqi civilians have been killed, a new window on the role that Iran has played in supporting Iraqi militants and many accounts of abuse by Iraqi's army and police, according to The New York Times which got early access to the papers. The vast majority of slain civilians were killed by other Iraqis, the documents said and also detailed Iran's role in supplying Iraqi militia fighters with weapons, including the most lethal type of roadside bomb. Field reports assert that Iraqi militants travelled to Iran for training as snipers and in using explosives, according to the Times. The Times said that hundreds of reports of beatings, burnings and lashings suggested that "such treatment was not an exception." Most abuse cases contained in the new batch of leaks appear to have been ultimately ignored, the paper said. WikiLeaks Editor-in-Chief Julian Assange told CNN on Friday that the new round of field reports shows "compelling evidence of war crimes" committed by forces of the US-led coalition and the Iraqi government. Pentagon Press Secretary Geoff Morrell rebutted the charge. “We vetted every single one of the documents, word by word, page by page," he told CNN, and added that the vetting began in July. "There is nothing in here which would indicate war crimes. If there were, we would have investigated it a long time ago." Assange said the documents contained more than 1,000 reports on the torture or abuse of detainees by Iraqi government forces and that he expects that 40 wrongful death lawsuits will be filed as a result of the new leaks. He dismissed concerns that the publication of the documents could endanger US troops and Iraqi civilians, asserting that the Pentagon "cannot find a single person that has been harmed" due to WikiLeaks' previous release of 76,000 pages of documents related to the US-led war in Afghanistan. The reports make it clear that most civilians, by far, were killed by other Iraqis. It cited two incidents as the worst days of the war, Aug 31, 2005, when a stampede on a bridge in Baghdad killed more than 950 people after several earlier attacks panicked a huge crowd, and Aug 14, 2007, when truck bombs killed more than 500 people in a rural area near the border with Syria. But it was systematic sectarian cleansing that drove the killing to its most frenzied point, making December 2006 the worst month of the war, with about 3,800 civilians killed, the reports said. About 1,300 police officers, insurgents and coalition soldiers were also killed in that month. The documents also reveal many instances in which US troops killed civilians - at checkpoints, from helicopters, in operations. New York: The UN has asked the US administration to probe the involvement of American forces in human rights abuses, summary executions and war crimes in following the "largest classified military leak" detailing accounts of torture and killing of over 66,000 civilians. The call for probe by the UN's chief investigator on torture, Manfred Nowak, came as Phil Shiner, human rights specialist at Public Interest Lawyers in the UK, warned that some of the deaths documented in the Iraq war logs could have involved British forces and would be pursued through the UK courts. London: Classified Iraq war documents made public by WikiLeaks are aimed at bringing out the truth, that had been the first casualty of war, the website's founder Julian Assange said on Saturday, adding that he wanted the leak to have the maximum possible impact. "This first casualty of war is the truth," Julian Assange told a news conference here, hours after the whistleblower released a fresh cache of classified military documents. BAGHDAD: Iraqi officials vowed on Saturday to probe any allegations that police or soldiers committed crimes in the country's sectarian war, after WikiLeaks released classified US files that gave details of prisoner abuse by Iraqi forces. The files mainly containing in-the-field action reports from lower level US military officers detailed gruesome cases of prisoner abuse that were known to but not investigated by US authorities. Rescuers were today frantically searching for two dozen people missing in Taiwan after Megi lashed the island killing at least 12, as the deadly typhoon made landfall in China. Megi, the strongest storm to hit the northwest Pacific in two decades, killed 36 people after it battered the Philippines earlier in the week, barrelling via Taiwan as it menacingly moved towards China’s southern coast. Emergency workers in Taiwan dug up nine bodies buried under the debris of a temple swamped by mudslides while two more were found in a house and a port in northeastern Ilan county, the National Fire Agency said. Among the dead were three nuns and a toddler, who were in the temple sheltering from the typhoon, which dumped a record one metre (three feet) of rain on the area in less than two days on Thursday and Friday. 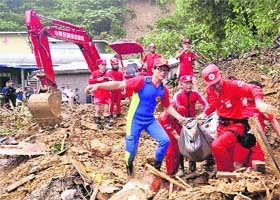 Also in Ilan, soldiers and rescuers continued their search along a highway where landslides left at least 26 people missing after Megi whipped the island with sustained maximum winds of 175 kilometres per hour. A Chinese tour guide and a Taiwanese driver were unaccounted for after their bus was hit by mudslides, although 21 passengers managed to escape. The local China Times quoted a mainland tourist as saying the guide and driver had stayed behind to help others escape before the bus was hit by falling rocks and sent tumbling down a slope. Rescuers have found the wreckage of the bus but it was not immediately clear if the two were in the bus or not, said an official at the agency. Three suicide bombers wearing police uniforms and burqas today attacked the United Nations office in the western Afghan city of Herat, senior police and UN officials said. There were no casualties among UN workers, Delawar Shah Delawar, deputy police chief of Herat province, told AFP after the raid, which was claimed by the Taliban. “One of the suicide attackers drove his explosives-packed vehicle into the rear gate of the compound. The two other attackers tried to enter the building after the blast but they were killed by guards and policemen,” he said. “At this stage we are searching the compound to make sure there are no attackers hiding inside the building,” he said, adding: “The attack did not cause any casualties to security forces or UN workers.” UN officials in Kabul and Herat confirmed the attack and that there were no deaths or injuries among UN staff, who had taken refuge in a safe bunker. The United Nations has been seen as a specific target of the Taliban since last October, when a Kabul guesthouse was attacked and 12 people, including six UN employees, were killed. The latest attack began at 12:30 pm, an AFP reporter on the scene said, adding that explosions and small arms fire was heard from inside the compound, which is about eight kilometres from Herat city centre.